OGTT is mostly preferred and is explained in detail here. IVGTT may be chosen for patients who are unable to absorb an oral dose of glucose (eg. malabsorption syndrome). 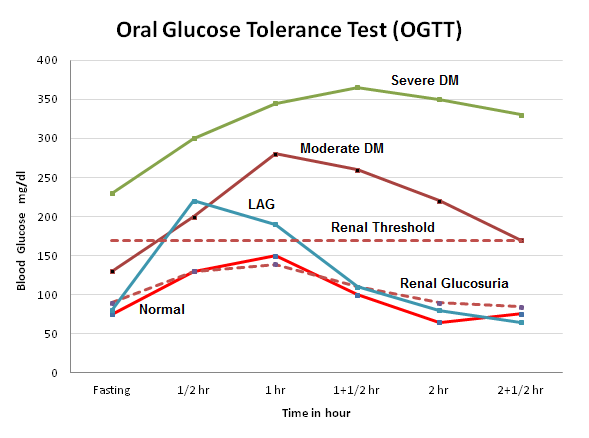 Following a standard oral dose of glucose, plasma and urine glucose levels are monitored at regular intervals, in order to measure tolerance under defined conditions. Patients having symptoms suggestive of diabetes mellitus, but fasting blood sugar value is inconclusive (between 100-126 mg/dl). During pregnancy, excessive weight gaining is noticed, with a past history of big baby (more than 4 kg) or a past history of miscarriage. To rule out benign renal glucosuria. Person with confirmed diabetes mellitus. OGTT has no role in follow up of diabetes. It is indicated only for the initial diagnosis. The test should not be done in acutely ill patients. The patient should be on balanced diet, containing normal daily requirement of carbohydrates, at least 2-3 days prior to the test. Patients should avoid drugs likely to influence the blood glucose levels, at least 2 days prior to the test. Patient should report to the laboratory after fasting for 12-16 hours. He/She can drink water. All samples of blood should be venous preferably. If the capillary blood from ‘finger-prick’ is used, all samples should be capillary blood. Patients should be in a position to wait at the laboratory for at least 2-3 hours, since 5 or more blood samples are collected at the interval of 30 minutes. A fasting sample of venous blood is collected in a fluoride vial. The bladder is emptied completely and urine is collected for qualitative test for glucose and ketone bodies. The individual is given 75 grams of glucose dissolved in water (about 250 ml). Addition of lemon juice leesens the risk of patient vomiting. Note the time of oral glucose administration. A total of five specimens of venous blood and urine are collected every 1/2 hour (30 minutes) after the oral glucose administration. Glucose content of all five samples of blood are estimated by the specific methods used in laboratory. Corresponding urine samples are tested qualitatively for the presence of glucose and ketone bodies. A curve is plotted by plotting time on X-axis and plasma glucose level on Y-axis, which is called Glucose Tolerance Curve (GTC). A typical normal response shows following features. Initial fasting glucose within normal limits. The highest peak value is reached within 1 hour. The highest value doesnot exceed the renal threshold (160-180 mg/dl). The fasting level is again reached by 2-2.5 hours. No glucose or ketone bodies are detected in any specimen of urine. Fasting blood glucose is definitely raised above 110 mg/dl. The highest value is reached after 1-1.5 hours. The highest value exceeds the renal threshold. The blood glucose level doesnot return to fasting level within 2.5 hours. This is the most characteristic feature of DM. Urine sample always contains glucose except in some chronic diabetes or nephritis who may have raised renal threshold. Fasting glucose level is normal. Rises rapidly in the 1/2 to 1 hour and exceeds the renal threshold so that the corresponding urine specimens show glucose. The return to normal value is rapid and complete. Glucose appears in the urine at levels of blood glucose much below renal threshold. Patients who show no glucosuria when fasting may have glucosuria when blood glucose is raised. in people who have LAG storage curve , for many years they remain like this. should they be offerred Metformin or left untreated. Any increased cardiovascular risk in these people or no. Always need such information.Thanks a lot. All the details are given in crisp form.very useful for students especially those who write exams. Your theory is well for practical theory.best for MLT student! Thanks a lot for give a right information in easy lenguage ..